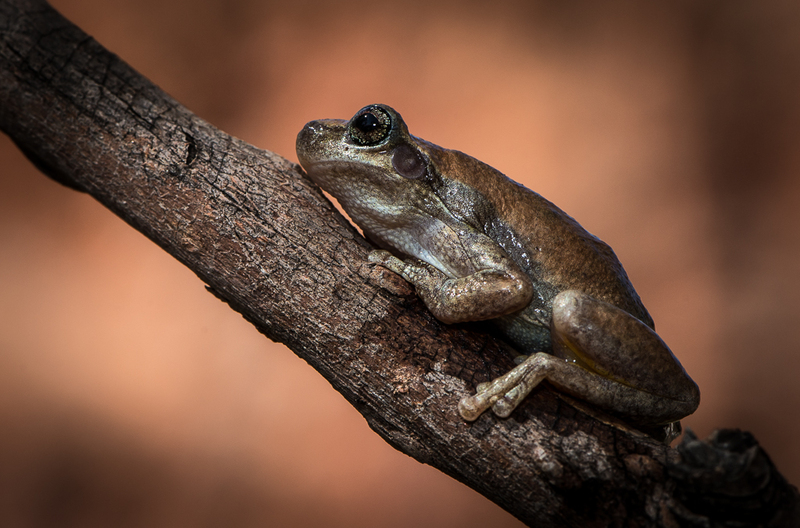 Judging | Blackwood Photographic Club of South Australia Inc.
Our first competition for the year on Thursday January 28 was a great starter for what promises to be a busy and stimulating 2016. The subject for the night was ‘Leading Lines’, which is a composition technique where the viewer’s eye is led into the image. Our judge was David Rowlands from Edwardstown Photography Club and what an encouraging and uplifting judge he was. With a significant number (115) of impressive images to work through he did so with a burst of positive and constructive feedback for every one of them. His comments were well considered, informed, concise and articulate. Regardless of how your photograph scored you felt like you’d both learned something positive from the commentary and you were left inspired to reach greater heights. With our constantly growing club the evening was well attended (about 45) by a welcoming and appreciative audience all very keen to learn. First time entrant, Di Gage presented us with two inspiring images, one of a very beautiful soft Victoria River sunset and another of a fishing boat and its perfect reflection complete with bird resting obediently on a rope. A perfect start with one image scoring full marks. Another relatively new entrant, Robyn Due, was justifiably excited to score a 9 for her Port Adelaide excursion image, entitled ‘Pot’ a well spotted image of paving, posts and buildings providing interesting leading lines. Mark Pedlar’s image (below) entitled Cornwall’s Motto captured, for those who weren’t there, the area in which the recent Port Adelaide excursion took place and plenty of Leading Lines. A quite stunning shot. The following are more of the high scoring ‘Leading Lines’ images from the night. To see more great ‘Leading Lines’ images visit the ‘Top Projected Images‘ and ‘Top Prints‘ pages. It seems to me that photography is one of those games where just when you think you’ve nailed some small part of it you are instantly reminded via someone else’s display of skill that you really haven’t and there is a long way to go. I’m convinced it is a never ending story of learning and I guess that’s why we all love it. Makes you wonder what kind of fabulous circles we can create with our next competition, entitled ‘Circles’, of course. Judging – the first time! The first judging at a photography club! Scary! Alberto called me on Monday of last week – could I fill in at the last minute for a club south of Adelaide? According to Alberto, a bit of a trip, but they were a friendly crowd, a bit like our little happy troop. So on Friday, Alberto and I trekked down the Victor Harbor Road on a wet foggy night to South Coast Camera Club. On the way we discussed (amongst other things) judging and how to be consistent. I’d re-read my judging school notes over the last few days, and thought about what I was trying to give back. There was lots to think about, and I didn’t want to be the type of judge I had complained about. On the night, about 40 people were present, and about 100 images ready to be judged! Now I was scared – I’d been told there would be about 50 images! They must have heard there was a gringo judge coming down! Competition Secretary Brad Hodge, President Andy Mitchell, Vice President Mike Gillies and Club Secretary Wendy Hodge greeted me and led me through the procedures and informed me about the 100 images. The gringo judge was ready! Brad and Mike presented the images and to be honest, the image quality was very good – similar to our little group. I had spent 10-15 minutes looking at the images before judging started to find what I felt were the top ones – judge between what is there on the night as Keith Seidel kept telling us at judging school. The set subject was Macro – something I feel I do well. However, Brad led with Open Colour – so it took me a while to get into my rhythm. When we did get to the Macro prints, I’d already judged 40 images and I’d done my homework and felt better about this set. Moving on to set mono prints was a doddle in comparison – just a handful of images there. Digital was harder as they weren’t divided into set or open, and choosing the best after 1 pass is no fun at all. That’s one reason I always give the judge at least 5 seconds to look at an image (time me next competition). All the time, I tried to keep it light and put in the odd one liner or joke. 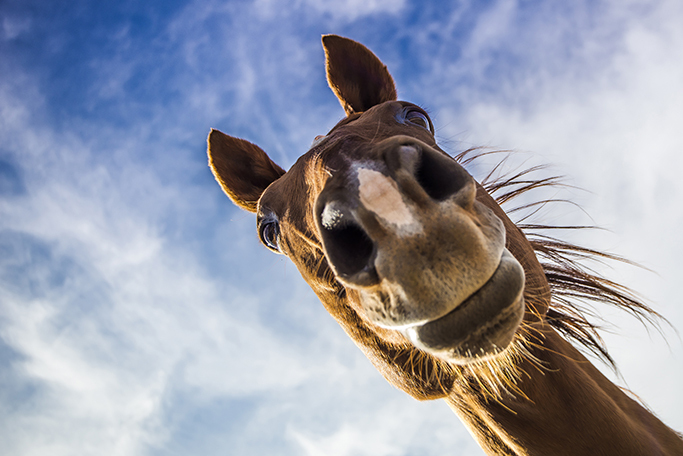 President Andy scored a few references from me (he started it when this horse image was shown at the start!). It’s amazing how you need to find the faults to tease out the scores. Yes – I dropped marks for poor focus, softness in the wrong place, composition that broke up what could have been a good image, not being close enough (Robert Capa strikes again!) and distraction (aargh – highlights!). I also docked marks for confusing or difficult images. Was that wrong? It is difficult to be consistent when there is such a broad spectrum of images. I did offer them the chance to beat me up after – in an orderly queue. To help novices, SCCC give the judge a little hint as to who is a novice – as a cue to increase the feedback – with a little yellow tag. And to be fair, a lot of the novice images were actually very good – and scored well. Some images just didn’t click with me, and finding the right words is very difficult when you want to be constructive. However, in the end, I felt I had done my best, and no lynch mob lined up outside to give me rough justice in return. Like our club, there were more colour prints than mono. There were fewer macro images than I expected, but I gave it my best shot. Some weren’t quite macro, but Brad requested I be flexible. I did change my score once or twice (bad boy!) and dropped the dreaded “step to the left” comment once (it really did need it – but I qualified it by prefacing it with “many judges would say”). Nerves were part of it – but then again I can talk my way out of most things given time, and I felt I did get more consistent. Alberto coached me from the sidelines between sections (a bit like a footy match) and gave me the thumbs up when I got things right, and a subtle shake of the head when I didn’t. My spread of marks was probably a bit high to start with (why so many 8s?) but I did settle down. I don’t think I handed out a 5, but a few images scored only 6. SCCC finish each section by getting the judge to choose the Honour (one of them – thank goodness I handed out only one 10 in each) and Merit images (3 – I handed out too many 9s) and at the end of the night the image of the night from the top 4. Talk about putting me on the spot again! Fortunately, when all was done and dusted, I felt I’d given out top scores to the best images, and given some reasonable and constructive feedback. And exhaustion was setting in. Remarkably, 90 minutes of judging flew by. The night finished with some supper – a short talk from me on macro stacking, and the usual thank you’s etc. The stacking talk resulted in an invitation to come back for a workshop. I hope I’ve made some new friends at SCCC! On the trip home I had my debrief with Alberto. Pretty good for a first time and I gave the top scores to what he would have. A few things though – don’t change the score, try and keep the constructive comments up as much as possible – particularly with the really difficult images, don’t refer to other images with faults as an example of why an image worked. Ok – I need more practice. I dropped Alberto at his house at about 11:45pm – and got home at about 12:15am. I couldn’t get to sleep. Had I given the images the justice they deserved? Did I offend any one? I hope not. I had probably dropped a couple of clangers and as I said, tell me what you are trying to achieve. Overall, I was reasonably comfortable with my first effort – not perfect, but not disastrous. I’ve learnt a few things and appreciate the effort good judges put in more. I promise to try harder for more consistency and constructive comment. I need to make sure that even the most difficult image gets given a positive comment. If I don’t – let me know! 21/04/2015 | Categories: Judging, Opinion | Comments Off on Judging – the first time! Judging – fighting the battle from within the parapets! This little web page has been a source of much discussion – heated and rational – about the judging standards in photographic clubs. We aren’t the only ones, but in our little corner of the world we were a squeaky wheel. Our web page and the articles (in March 2011 and April 2014) about judging have been used as ammunition in a battle both in South Australia and South America (I kid you not). There are probably others (drop us a line if you did). I’m sure many people have read our blog and nodded or shaken their heads. Felt our pain. Shared in the angst of inadequate judging. The discussion began due to the frustration many of us felt about the quality of photographic club judges. They seemed mired in the past. The technical aspects were the only thing examined. Trends in modern photography ignored. Were we pursuing art or were we aiming to be good technicians? I confess that I’m one of the instigators of this discussion. I had seen my photography decline as I tried to please a bunch of people that to me seemed locked in a time warp somewhere around 1970. I realised what I was doing and started to climb out of the abyss. It took some time. The squeaky wheels – not just our little club – started to be heard around the photography clubs in this state. Judges were discussed in both whispers and loudly. How could we change things? We discussed this many times. The suggestion – change it from within. “No” many of us cried. “Too hard”. “Don’t have the time”. “It’d be a lone voice lost in the wind”. At the same time, the SAPF executive noticed – and set about reform and change. Training more judges. Getting a broader range of opinions. Keith Seidel and John Hodgson took on the task. SAPF President Alberto Guirelli talked at club meetings around the state about changing the culture. He even became a judge! Judging schools were revised. Other opinions sought. The SAPF now had more and varied judges. We started to notice something new in the judges that came to our club. We were often told that the scoring was their opinion. That our own opinion of our images counted as much. What? Hang on? What happened to the 1970s technical judge? That rule of thirds guy? They were starting to fade. Technical issues were still considered – but as a method to refine down to what was the best image of the night. Not as the only arbiter of what was a good photography club image. And then one night last year I was asked to put my own voice into the mix by Keith Seidel after a particularly poor judging effort we had both observed. “Come along to the judging school. Be part of the process.” said Keith. I had to put up or shut up. So in February this year, 10 of us went along to SAPF head quarters and spent the day learning about how to judge. We went through a range of topics led by Keith, Peter Phillips (who judged one of my first images when I started) and Des Berwick. We heard about what made a good image – Visual Impact, Composition, Interesting, Purpose, Originality. Oh – and then some technique. But not to exclude the other aspects. We discussed distractions in an image. Balance was considered. Flat lighting. Things that diluted what could be interesting. And then the crux of it – judging is relative and not to some pre-conceived standard. Judging should be diplomatic. A good judge should recognise a good image and have an open mind to other image types. Bias should be left outside as should ego. Cliche’s abandoned. Keep up with new trends. Be an active photographer. Understand photographic camera and processing techniques. Be Consistent and Constructive and Entertaining. Ye Gods! This sounded like our wish list! What had happened? People had listened! The differences between solo judging and panel judging were discussed. We got to do a panel judging of our own just before lunch – a very sobering exercise. Then we got into some examples – using stills from television programmes. Yes – some of the best photographic art is in TV and film. The creative use of light, focus, placement, viewpoint, perspective. 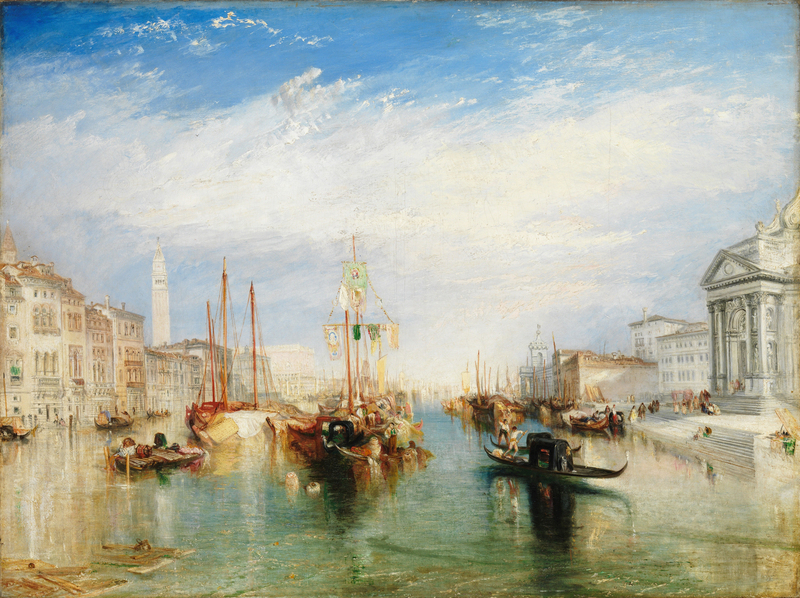 Look at the great artists such as Turner or any of the impressionists. The history of photographic techniques. Trends from modern photographers like Trent Parke (Australia’s own and only Magnum photographer). Learning from the great photographers of the past and present and why they are great. More aspects of judging – what to say and what not to say! Get rid of those cliches that add nothing. We covered country judging too – supporting those who can’t have a judge on site every meeting. (For reference 1/3 of South Australia lives outside of Adelaide and deserve better). I’m pleased to say I’ve signed up to help Jeff Venning and his country judging team. The day had a lot to take in. I’ve got pages of notes and thoughts and ideas. To finish we judged ourselves. We’d been asked to send in 10 images which were mixed up and presented to us. We judged each of them and noticed the mix of scores around the room. Some were instant hits, other images divided the scores. In that session the broad church of judging was clearly exposed. At the end of our day – and it was a long one – Keith announced that he and the others felt we were all ready to go out into the big wide world of club judging. A surprise perhaps, but Keith has been watching and listening to us. At the recent SAPF AGM and Delegates Meeting Keith reported exactly the same thing. Thanks Keith, Peter and Des – I promise to do my best. So there you have it – a mea culpa of sorts from me. I’m now a photography club judge. Will I bring a new perspective and more balance? I’m a bit apprehensive – but will give it a go. If you find my judging inadequate let me know. Tell me about what you were trying to achieve. I’m not perfect and have never claimed to be. But I am empathetic – and maybe that will be my saving grace. The latest edition of Camera Clips was sent out to club members today by James. Once again, a good selection of interesting articles from club members – well done James for putting together a collection of really useful articles on composition. 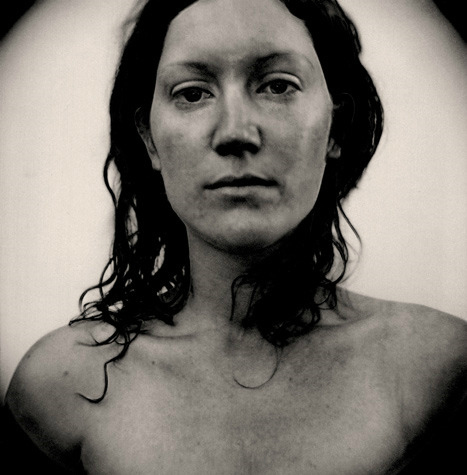 Two articles really caught my eye about that hoary old chestnut – photographic judging. Many of you know what I think about it, and to be fair, SAPF President Alberto Guirelli is working with the SAPF committee to change the culture. However, the following articles from James Allan and Mark Pedlar will make you think some more and refresh the discussion. These statements appear to be emphatic and should not be broken. In fact I have been told that it is OK for me to alter my image with Photoshop if it means that I can eliminate one of these faults from my image. Now have a look at this monochrome portrait. This picture was entered into an International Photo Competition with National Geographic magazine. It has flat lighting with little modelling of the features. The top of the head is chopped off. The corners of the image have a harsh distracting vignette. The model is looking level and straight into the lens without emotion or gesture. She could have been instructed to look more appealing in this stark picture. Technically it could have been done in a photo booth. It won the people’s choice award. This is what the judges wrote about this image. Or look at this photograph of a dog which was also entered into the same competition. The dog is dead centre in this picture. It is lost in the pattern of the façade and does not stand out at all. There is a near perfect reflection of the scene which competes for the eye of the viewer. One is confused as to whether to look up or look down. Perhaps the photographer should have cropped either the scene or the reflection to reduce ambiguity and give a greater sense of balance or harmony. In this case the picture was awarded an honourable mention. 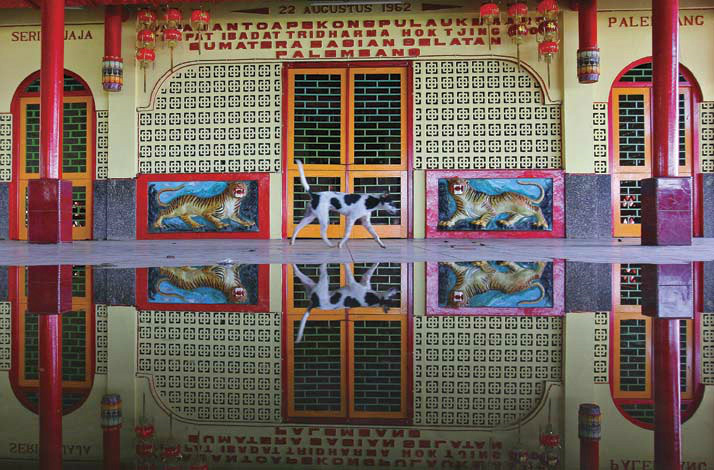 At Hok Tjing Bio, a Chinese Temple in Palembang South Sumatra, Indonesia, the photographer has framed the shot at a precise moment, with the reflection, and the position of the passing dog in the middle of the tiger pictorial on the temple’s wall. Despite all that I have learned about breaking up symmetry, this judge applauds the effort to portray and reinforce the symmetry of this image. 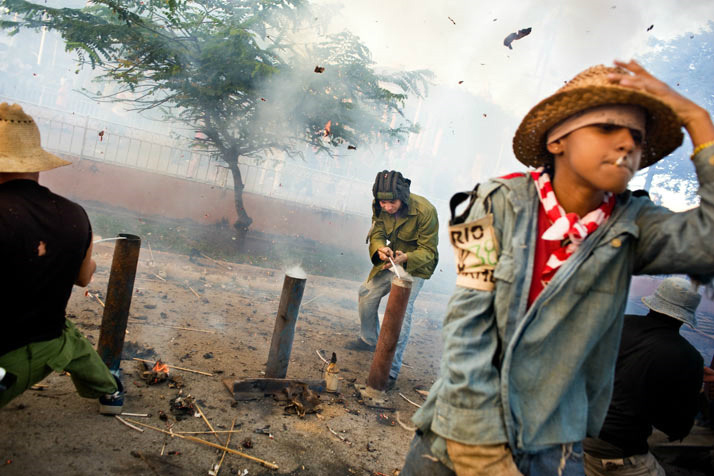 Or how about this picture of some Cuban kids letting off fireworks. The horizon is not straight. The characters are moving out of the frame of the picture without there being room for them to move into. Two of the figures have been amputated by the frame of the picture. The largest of the three figures is entirely blurred. It however also received an honourable mention. The caption reads, The picture was shot at San Juan de los Remedios, Cuba, during a local celebration called “Las Parrandas” in which the highlight is fireworks. Here children light the fireworks and escape. 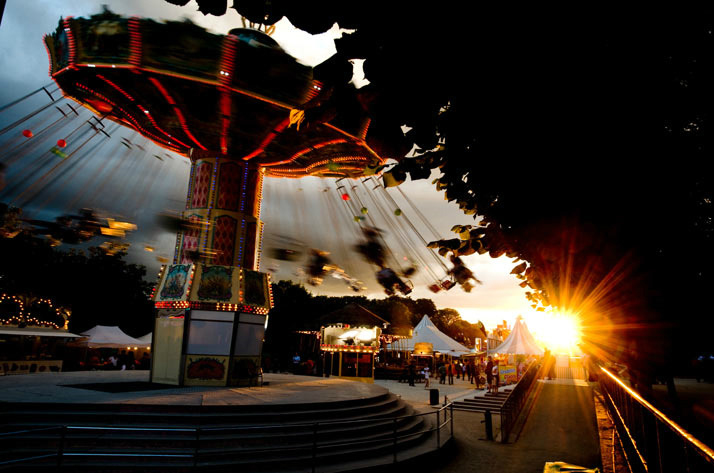 Lastly this image of a fair ground. Again the horizon is crooked, the main subject, the carousel is entirely blurred. There is a very bright highlight in the sun competing for attention with the subject. This one however was the winner of this section of the competition. What I have learned at photo club seems to be at odds with the way the National Geographic judges have been assessing their images. What were the judges thinking of? Haven’t they heard of the rules of composition? Didn’t they attend a photo club? What is going on? There seems to be a difference in the way we are looking at the images. My initial comments for each image are based on a set of empiric rules. They have been told to me week after week as I attend the various competitions. The National Geographic judges however allude to their emotional reactions to the image. They seem unperturbed by the transgression of the rules, as long as the picture finds a resonance, or emotional quality. As Mark Pedlar puts it – the image has impact. Perhaps we should not think of these photo club statements as emphatic rules, but as techniques of composition. Let me give an analogy. Although a polarising filter has a pleasing effect it is not mandatory that you should always use one in every photograph. Sometimes the polariser can really look awful. Likewise there is no rule that says that your horizon must always be straight. In the 2 photographs above the uneven horizon creates a sense of movement and drama in the picture. In each case a straight horizon would ruin the effect. Conversely, the horizon is better straight when you intend a sense of balance or calm. So how do the National Geographic judges ascribe merit if there are no rules? This is perhaps the easiest and hardest part to grasp. It seems they ascribe merit by their emotional response. That seems arbitrary and subjective. Not so. The photographer has a vision they wish to convey. The good images are more successful in swaying the opinion of the judge, better at showing that vision. In fact the set of compositional rules is more arbitrary as it instantly dismisses quite a large number of images. Images that may win International competitions, images that might thrill and excite us. To sum up, I believe that we need to look at pictures differently. We need a different set of spectacles. It is not about adherence to a dozen rules or guiding principles. I think that is an old prescription that served us well when we were starting to learn the ropes of photography. Now it is time to take off that pair of glasses and look for that inner response that the image creates. What is the photographer’s vision and did they convey it well? We need to relook at the pictures with a better prescription, and I think we will begin to see things that we didn’t see before. I believe we will find more enjoyment in our photography. Don’t show the whole thing. Why did you like the scene? What is the essence? Isolate it. Leave out the rest – just photograph the key ingredient. Don’t over indulge the subject. Movement engages. Freeze it or blur it – it doesn’t matter. Curves and diagonals create movement. Crooked horizons. The centre is balance, the edge is movement. Look for movement in the picture. It can transform the subject. Photograph where it shines, where it leads y our eye, where it casts a shadow. Keep walking around until the light lets you in. The concept is usually wrong. Take what you see, not what you want to see. What does this object need? A town house needs to be cramped. A manor house needs an estate around it. Try it different ways. The Japanese also look at the space between objects. Should objects be separate, should they touch or even overlap? Look at photos you like. Watch what others do. Suppress your instincts and do it their way . (It will never be their picture if you take it). Take the shot anyway. Learn to tolerate blemishes. Mistakes can be miracles and save us from conformity. Lines will connect objects and make them interact. There are real lines (eg fences) and interrupted lines (eg a row of soldiers) and imaginary lines (eg gaze of a person or direction of a car). Parallel lines are balanced, curved lines create movement and are dynamic, converging lines give depth, while crossed lines clash and create conflict. All are good. You should not have burnt out highlights – and no bright spots on the edge of the picture. Over a quarter of a century as a camera club member in Adelaide I’ve had most of James’ ten points levelled at my images. The thing is that they all contain grains of truth. They simply aren’t and should never be used as rules. Our word horizontal, meaning flat, takes its name from the horizon which we all assume to be level. If you are shooting traditional representative seascape you will probably have the greatest impact on your viewers if the horizon is flat. In James’ carousel image the tilted horizon adds to the impact. It is often the case that we find images with a subject offset from the centre more pleasing than those where the subject is dead central. We don’t need to go through all ten; the point is that all can be guides to beginners in photography when they are designing their images. Similarly, the ‘rules’ of composition are guides. You don’t necessarily need an ‘S’ shaped composition, or a triangular one. Diagonals can be pleasing. The point again is that these are guides. I have talked at several camera clubs about IMPACT in images. In this I’ve used some of the images from Henri Cartier–Bresson world acclaimed as an outstanding photographer. In these many of the human subjects have limbs or parts of limbs amputated by the frame. Yet these are lauded as photographic high art. So the rules don’t always apply. You should never be hide-bound by the rules but it helps to know the tips at the outset. So, why do so many judges appear to place such importance on rules? Tonight I’ll stand in front of 20 – 40 photographers in a suburban club and judge 100-120 of their images. I’ll judge each of the images out of 10 for their artistic merit. This merit will be a combination of MY OPINION of the composition, technical merit, subject material, lighting viewer impact etc. I shall also give a brief critique of each image. For those lower scoring images the objective is to provide a few tips for demonstrating greater artistic merit next time. At this stage many judges tend to need to justify the score they are about to give. I am about to score 4 out of 10. The author deserves some reason why their image scored so low. It is easy then to fall back on James’ 10 points to show what was missing in that image. That sounds like a cop-out, it isn’t but it can happen. The National Geographic judges were not required to give each author both a score and a critique of their image along with a similar critique of all the other entries. However, they did pick the best even though these broke the so called rules. I believe the very system of club judging can mitigate in favour of the tendency to fall back on a formula. As a result club members become acclimatised to presenting images which follow the rules. Further, since judges are drawn in large part from long term club members they can bring with them the culture of these ‘rules’. Look at the images produced by Uni SA undergraduate. They bear little resemblance to those seen in club competition. Many are far more adventurous. More significantly, several club members took part in a 31 day challenge over the Christmas break. Some of these images were shown at the club’s first meeting of this year. Many were stunning! Several showed originality, excitement and adventure which doesn’t seem to re-surface in club competitions. We have a wealth of unobserved talent out there. Why is it we do not see some of these images in regular club competitions? So, take photos for yourself not for a judge. Keep the ten tips in the back of your mind, they can be helpful. Whatever the judge says, theirs is only one person’s opinion. Show the club your best work. There you have it – a very effective discussion about the difficulties of shooting for yourself and what the rest of the real world is doing. As for those rules, to paraphrase a famous pirate movie – “the judges rules is more what you’d call ‘guidelines’ than actual rules”. So go out, take photos, enjoy your passion, but don’t be limited by the amateur photography world and their judges. The following is from an email discussion James Allan started earlier this week. With his permission, I’ve included the email and appended the initial reply (from me). James certainly started a lively discussion in the club! I’ll post the other replies as other authors give their approval for posting here. Why don’t they paint great pictures any more? I contend that the artists are intimidated. It’s because photography is now the superior artistic medium. The great artists can no longer compete with the skill and sophistication of modern photographers. Let me illustrate the point. I will take a random selection of famous paintings from the worlds galleries and give you an example of the kind of flack (the yellow text) they would attract at the humblest of camera clubs. Certainly a good attempt at a group interacting at the seaside, however there are a few pointers for some one new to photography. My eye is travelling hither and thither trying to find somewhere to rest. There are 4 characters all looking in different directions and none of them seems to be interacting very convincingly. Surely it would have been easy to get them all to huddle together, give that girl a towel, and get them to look in the same direction. Perhaps it might have worked better had you taken a different vantage point, perhaps from the shoreline so that you could get rid of the distracting element of those trees. Now I must say that the lighting is very flat. You should have arranged this scene in the early morning or evening. As I said a good attempt, perhaps a bit busy, but I would have given this 9 points had it not been for that horizon. It’s 1.3 degrees off horizontal, so that’s what I’ll give it 1.3 points. I must congratulate the artist on the use of the rule of thirds. The building is nicely placed on the thirds. However I am very concerned by the overall softness of the image. Really a landscape painter should be able to do better than this. I really can’t see what the artist is focussing on at all. There is a strong diagonal distortion of the highlights that makes me wonder if there was some blurring due to movement. Perhaps the artist should have used a tripod and taken more time taking the picture. I also note that the contrast is quite stilted. If you play around with curves you should be able to adjust the image so that you get a good dynamic range with dark textural blacks and brilliant whites. Lastly and most importantly there is a pervasive colour cast to the image. It looks like the artist has spent too long inside under an incandescent light and now that he is outdoors he has the wrong white balance. Everything is bluey green. Again you can correct this in curves. Really it’s worth the effort, you will see the full depth of colour return to your work and you will be much happier with the result. I will give this one 5. 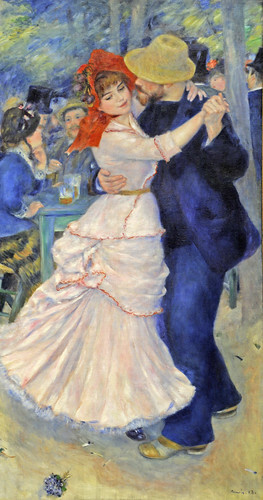 A lovely pose with the two dancing in a crowded village space. You have captured a nice intimacy between the two characters. It’s a pity that you spoilt it all with your treatment. You have cropped in too closely to the pair. You should leave a little space from them to move into. I can understand that in a crowded situation like this you probablly had a lot of competing details to crop out, but I can’t see why instead you don’t just clone them out and retain that sense of balance in the image. The couple are dead centre and again I would have liked to see them a little offset, perhaps on the thirds. However the greatest probelm with this image is that you have turned up the saturation far too high. This picture is positively garish and for that I will subtract points. 3. It is always difficult managing to deal with interiors. This is a good record shot of where you slept on your holiday to Arles, but I can’t see that it’s much more than that. The lighting is flat. I can’t see any shadows or comtouring. My guess is that you used the on camera flash, either that or it has been heavily procesed with HDR. You have made an attempt to correct some of the deficiencies in this picture in the post processing. Again the saturation has been over emphasized and there is this dark halo around most of the edges which suggests to me that you have oversharpened the image. Really it hasn’t had the desired effect. There is no more detail in the picture, just all of this extra noise. I think it would be better if you spent a little more time with the camera and less in the darkroom. Use natural lighting. You may have to bracket a bit to find the correct exposure. Show the light from the window streaming across that floor. Let the corners of the room remain dark. Use a tripod. An heroic attempt to rescue a mediocre image, 5. I am having a lot of difficulty with this image. I’m struggling to find anything positive to say about it. It’s out of focus, all of the detail has been washed out, it’s over exposed, it was a terribly overcast day. I really can’t see what inspired you to make this painting. Well I guess it’s printed on nice quality paper and at a good size so I should give it at least 6 points for making the effort. Well there you go. Do you see what I mean? I think that the modern painters should bow their heads in shame. They have got a lot to learn from modern photography. I’ve got no idea why more of them don’t attend a local camera club. After all the camera clubs would always be happy to teach them a thing ot two. They are always scratching around trying to find new members. An interesting piece James – and timely given the feelings after the last competition. It seems after most competition nights we all feel a bit let down or frustrated by our perception of the quality of judging, and your essay highlights those frustrations. Some members even don’t enter images due to their poor experiences with judges understanding of their images. 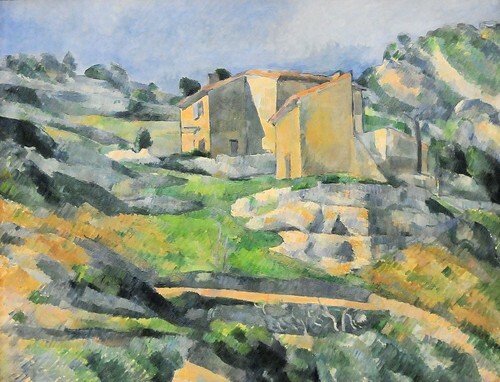 I fully agree that the judges would regard these famous artist as inadequate in their view – but then again, many art critics of the impressionist era regarded them poorly as well. Consider the low regard for van Gogh during his lifetime, or Monet who was initially unsuccessful in his endeavours, but from whose work the Impressionists are named. Perhaps the issue here is the myopic views of critics and judges. They follow a fashion or a set of rules which they cannot see beyond. As James points out in the discussion, if your image doesn’t fit their limited criteria it scores poorly. I would appreciate it if someone could succinctly list the criteria used in judging – because (as some have pointed out to me) you adjust what you present to suit the judge (and it probably pays to know the judge). If thats the case, then we all need to know what the judges look for if we just want high scores. I’m aware of the need for sharp focus, no distracting highlights, a clear region of interest to draw the eye, appropriate contrast, colour etc. The paintings James has presented break those rules. But they also succeed because like a photograph, they are also a personal expression of the individual – the persons style (I like to use interesting angles – but thats frowned on – and I can’t have converging lines!) – and how do you judge that? Interestingly, many great photographers would probably score poorly too – there is a good article which I think James first pointed out about Problems in Judging Photo Competitions – http://www.studiolo.org/Photography/Judging/Judging01.htm that highlights this. A good judge (and we have seen them) will have what my father-in-law called “catholic tastes” – wide ranging and broad experience – and therefore see images in different ways and be sensitive to personal expression & style. An image should be judged on what one judge we had described as the “wow factor” – and which I would extend to include the “makes me think” factor. These need to be encouraged if we are to improve as photographers expressing ourselves and not as just technicians. However, the perfect technical image is not necessarily the image with the greatest visual appeal. Therefore downgrading an image due to what the judge perceives as the wrong highlight or symmetry or distracting object or direction of flow (left to right vs right to left) or the degree of focus (soft focus is a useful tool!) is to be questioned – and I have on occasion done this. As some have suggested, judges seem to think over-sharpening or cloning things out in Photoshop (like a pesky human or stalk of grass) or cropping to exclude an element in the image (despite its importance to the story) is the method of choice. Additionally, a good judge needs to provide constructive criticism of images – what is good and what is not so images can be improved. The judge needs to be honest too – one judge recently declared his opinions were subjective and not to take offence. Fortunately, he also provided constructive criticism. Perhaps the method to move judging beyond the purely technical and so encourage stylistic expression is to use tools like the “peoples choice” votes that James mentioned at the last meeting – which has been used at the club in the past. At least its a consensus view, not just one persons (possibly jaded) opinion, and even reflective of current stylistic influences. Importantly, it demonstrates what your peers think of your image – not some judge with no understanding of the image. They even have that method in awards such as the Archibald Prize. At least then we get beyond the sausage factory the one rigid technical style can engender. To change the quality of judging and encourage stylistic expression, the issue should be raised in a larger forum such as the SAPF or APS. These bodies provide and I believe train judges, and therefore have a responsibility to raise the standard of judging and respect the personal expression of our vision. The methods need to be transparent so we all benefit, and if the judging criteria are too esoteric or technical then the question has to be asked “Why?”. Thats my two bits worth for now – thanks for raising the issue James. If I may be so bold, James’ article would make a good blog article. Ashley had suggested he was going to write one, but now that James has made a start, then with his permission, could we put it on the web site? And we can continue the discussion in full view of the internet community. So there is the start of the discussion – a few emails have flown about since then – most supportive, and some suggesting if we want change, we need to lead from the front and take up judging ourselves. I’m considering it – along with a few others. If you’d like to contribute to this discussion, feel free. And if you’d like to take up judging and change the world then have a word to the committee – or the SAPF – about the judges training course.